A company in Warwick has used rocket science technology to develop an app which could revolutionise the way we all measure in the future. 3D Technologies has released Moasure, an app which can measure up to 100 metres and is the first of its kind to use motion sensors. The company, based at the University of Warwick Science Park’s Warwick Innovation Centre, has spent two years developing the app which works when an iPhone is moved between two points. While the user is moving, the app precisely calculates the distance or the angle between the points. Moasure has already achieved a top 10 ranking in the App Store’s utilities category in 22 different countries and number one in 11 countries. The app uses the same technology found in space rocket guidance systems and is completely unique after company founder Alan Rock patented motion sensor-based measurement tools 12 years ago. He said: “I had the idea 12 years ago before smartphones existed and had to wait for the technology to catch up. I then launched 3D Technologies two years ago with the specific purpose of developing the app. “Motion measuring is the future of measuring and there is nothing like it already available. Other apps use the camera function, or a ruler the length of the phone to calculate distances and are nowhere near as accurate. “The software uses the iPhone or iPad’s accelerometers and gyroscopes to calculate the distance and rotation when you move it from one place to another, mapping out length, width and height. “Moasure also knows how to measure in a straight line when the iPhone or iPad is carried in an arc around an obstacle and will measure as if it wasn’t there. 3D Technologies joined the Science Park’s Ignite incubator as a start-up company in September 2014, receiving support from the Science Park’s business mentor Dirk Schafer. Amongst others, Dirk helped 3D technologies access an Innovate UK grant for the company’s innovative inertia based 3D measurement system for smartphones. Earlier this year, 3D Technologies graduated from the Ignite programme moving to larger offices at the Warwick Innovation Centre adding more staff. It is now benefiting from advice through the Science Park’s Business Ready programme to help grow the firm and to access finance for future developments and scaling the business. Dirk Schafer, of the University of Warwick Science Park, said: “Commercialising an app is very difficult as we all know. It is good to see that hard work, innovation and determination does actually pay off and can be a profitable undertaking if addressing a market need. Alan added: “We have moved into a larger office to accommodate the company’s growth and are currently developing an Android version of Moasure. We will then be continuing to develop the app and include additional features. 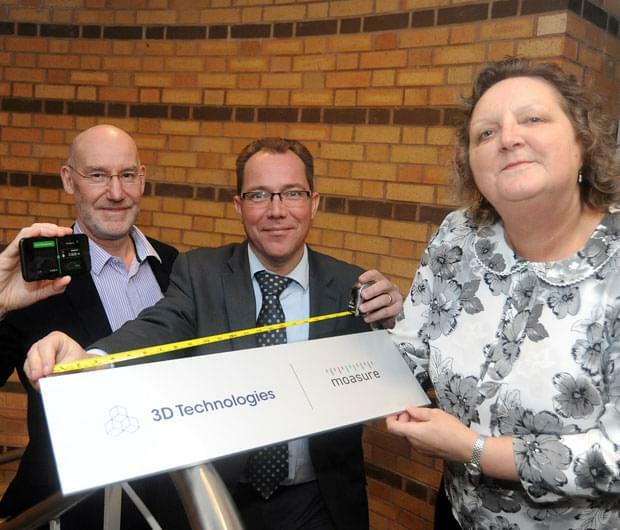 Karen Aston, manager of the Warwick Innovation Centre, said: “3D Technologies has used the latest technology to create a unique app which accurately measures between two points and we have been delighted to have supported the company from its infancy.